The Lee College Athletics Department recently partnered with students from the Robert E. Lee High School Interact Club in Baytown to donate 1,300 canned goods to St. Paul Lutheran’s Church in an effort to help fight hunger in the local community. This latest donation allowed the athletic department to reach its goal of donating a total of 20,000 canned goods to the community since the “I Can, You Can, We Can” collection drive was started in 2009. BAYTOWN, TX — With Thanksgiving approaching and many local families in need of help to fill their cabinets and pantries, Lee College basketball and volleyball student-athletes partnered with the Robert E. Lee High School Interact Club last week to donate 1,300 canned goods to St. Paul’s Lutheran Church in Baytown. This latest donation allowed the Lee College Athletic Department to reach an ambitious goal set when then-Athletics Director and Head Basketball Coach Roy Champagne launched the “I Can, You Can, We Can” initiative in 2009: to collect 20,000 canned goods to help feed the hungry in the community. After collecting 1,600 canned goods in the first year of the project, the athletic department has collected and donated 6,100 canned goods this year alone. Even more canned goods are still awaiting delivery to churches, charities and food banks all over town. Both Champagne and Head Volleyball Coach Paige Sorge believe Rebel and Lady Rebel athletes have a responsibility to volunteer their personal time and give back to the community in any way possible. 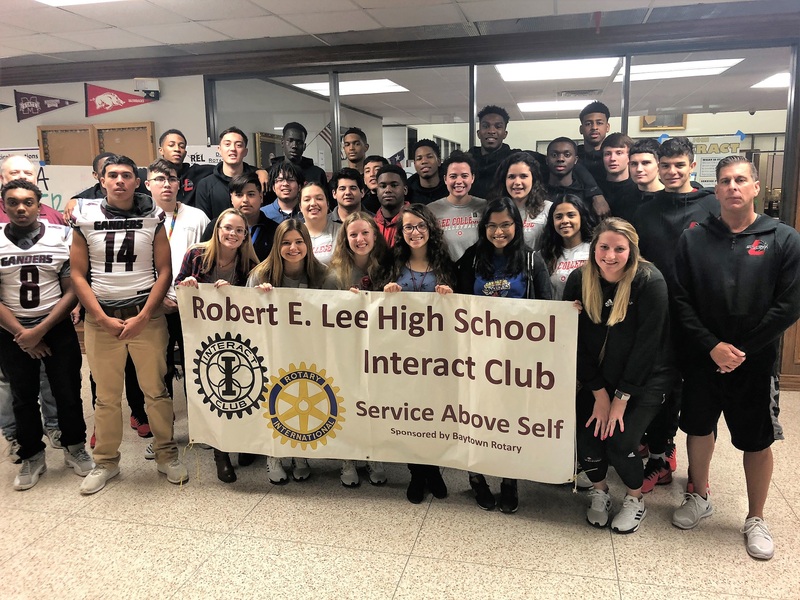 Members of the basketball and volleyball teams regularly visit local elementary schools to speak out against bullying and encourage kids to be stellar students and avid readers; spend time with, mentor and cheer on high-school athletes at their games and practices; and help cook and serve free dinners to neighbors in need. “It’s a good way to show the community they’re thankful and appreciative for all the support and resources they’ve been given,” Sorge said. 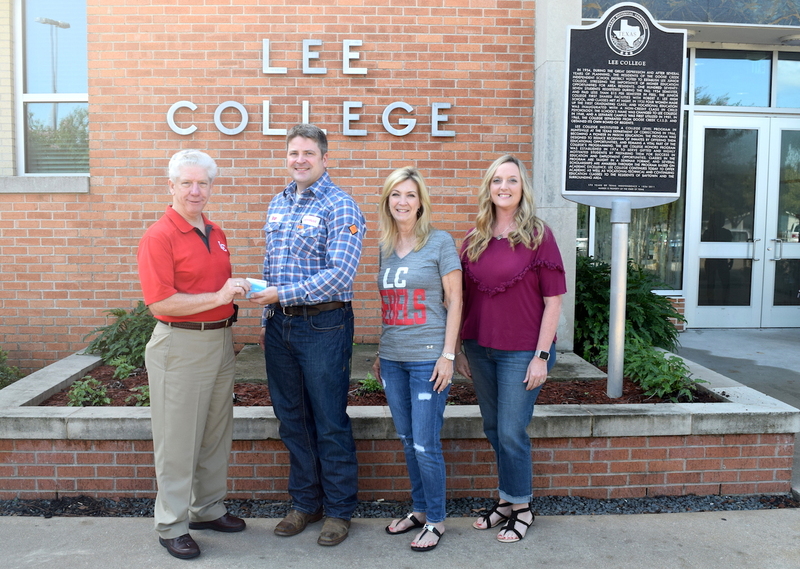 ExxonMobil donates $5,000 in gas cards to the Lee College Hurricane Harvey Relief Fund on Friday, Sept. 22, 2017, to help students impacted by the storm cover the costs of transportation as they recover and rebuild. Since it was created, the relief fund has reached more than $100,000 that will be provided to Lee College students and employees in need. Pictured (l-r): Lee College Pres. Dr. Dennis Brown; Brian Nagel of ExxonMobil, Lee College Executive Director of Foundation and Resource Development Pam Warford; and Connie Tilton of ExxonMobil. BAYTOWN, TX — Shortly after Hurricane Harvey battered Baytown and surrounding communities with heavy rains that produced catastrophic flooding, Lee College Pres. Dr. Dennis Brown and members of the president’s cabinet decided to create a disaster relief fund to help students and employees recover from their losses and rebuild their homes and lives. Now, just over a month after the storm first made landfall in Texas, the Lee College Hurricane Harvey Relief Fund has raised more than $100,000 and growing. The Lee College Foundation, Scholarship America, Santa Fe College in Florida, Inceptia, the Collette Foundation, ExxonMobil and numerous individual donors have all made sizable contributions. At the September meeting of the Lee College Board of Regents, Brown thanked donors for their generosity and praised staff for working so quickly to set up the fund and “get the money in the hands of those who are most in need” — including the hundreds of students and employees so far who have received help to cover the cost of textbooks, tuition, transportation, food, home repairs and other expenses. Law enforcement and criminal justice major Jasper Fairman is one of those who received much-needed assistance from the relief fund. Fairman and his wife, then pregnant with their daughter and scheduled to deliver at the end of August, evacuated first to Lake Charles, La., but got flooded in and lost a vehicle when Harvey moved east. The family then traveled to Austin to stay with relatives but when they returned to the Houston area, their trailer was uninhabitable and Fairman didn’t have the money for tuition. “For three weeks, I couldn’t work because of the storm. We evacuated, came back and I still couldn’t work, but I had it in my mind to continue my education for this fall so I could stay on track toward my graduation,” said Fairman, who was unable to secure financial aid in time to meet the payment deadline. He had just found out his classes had been dropped for non-payment when he learned about the Harvey relief fund and put in an application. Baytown native Anabel Briones, who also received help from the Harvey relief fund, graduated from Lee College with an Associate Degree of Nursing three years ago but returned to satisfy prerequisites for her bachelor’s degree. She and her husband, a welding student at the college, evacuated their home in the Pine Meadows subdivision at the last minute to protect their young daughters as the water rose. “When it was safe for us to come back home, I walked into my house and had the breakdown of my life. Everything we’ve been working so hard for was destroyed,” said Briones, a registered nurse who continued to work during Harvey but has since taken a leave of absence to focus on rebuilding her home. Though they lost a car in the storm, are displaced and staying with relatives, and have been turned down for other forms of assistance, Briones and her husband are determined to stay in school. Lee College students and employees continue to apply for help from the Hurricane Harvey Relief Fund, which is still accepting donations. To give, visit www.lee.edu/harveydonations or contact Pam Warford, executive director of Foundation and Resource Development, at 281.425.6361 or pwarford@lee.edu. From left: Marsha Tuha, Interim Director of Corporate Services at Lee College; Debi Jordan, Executive Director of the Center for Workforce and Community Development at Lee College; Wayne Gray, Lee College Board of Regents; Brian Nagle of ExxonMobil; Woody Paul, Manager of the ExxonMobil Baytown Olefins Plant; Ronn Haddox, Chairman of the Lee College Board of Regents; Pete Alfaro, Lee College Board of Regents; Layton Childress, Dean of Applied Sciences at Lee College; Mark Himsel, Lee College Board of Regents; Dr. Carolyn Lightfoot, Chief Information Officer at Lee College; Dr. Christina Ponce, Vice President of Student Success, Workforce and Resource Development at Lee College; and Dr. Dennis Brown, Lee College President. 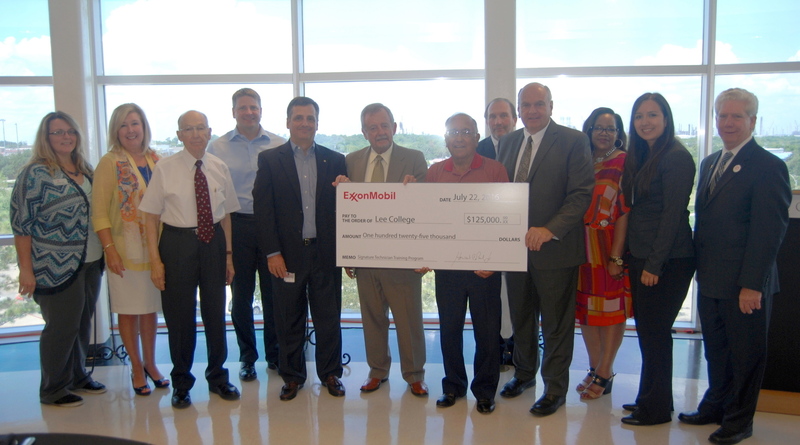 From left: Woody Paul, Manager of the ExxonMobil Baytown Olefins Plant; Joe Whiddon of ExxonMobil; Connie Whiddon; Brian Nagle of ExxonMobil; Wayne Gray, Lee College Board of Regents; Ronn Haddox, Chairman of the Lee College Board of Regents; Pete Alfaro, Lee College Board of Regents; Mark Himsel, Lee College Board of Regents; Dr. Donnetta Suchon, Vice President of Student Affairs at Lee College; Pam Warford, Executive Director of the Lee College Foundation; and Dr. Dennis Brown, Lee College President. From left: Debi Jordan, Executive Director of the Center for Workforce and Community Development at Lee College; Brian Nagle of ExxonMobil; Woody Paul, Manager of the ExxonMobil Baytown Olefins Plant; Wayne Gray, Lee College Board of Regents; Ronn Haddox, Chairman of the Lee College Board of Regents; Pete Alfaro, Lee College Board of Regents; Dr. Michael Fleming, Executive Director of Institutional Planning, Effectiveness and Research at Lee College; Marisela Morales, Lee College student; Mark Himsel, Lee College Board of Regents; Ellis Dorrance, Lee College student; Kelly Dando, ExxonMobil Grant Project Coordinator at Lee College; and Dr. Dennis Brown, Lee College President. BAYTOWN, TX — Leaders from Lee College and ExxonMobil recently came together to celebrate more than 80 years of successful partnership, and recognize the company for contributing more than $258,000 this year to academic programs and student success initiatives that prepare students for long-lasting and well-paying careers in a growing industry. ExxonMobil presented the college with three donation checks at a special luncheon held Friday, July 22, on the third floor of the Advanced Technology Center: $15,000 for the EnergyVenture summer camp hosted by the Center for Workforce and Community Development that gives middle school students the chance to explore energy industry careers; $118,500 in ExxonMobil Foundation educational matching funds that will be used for student success efforts; and $125,000 for technician training programs like process technology and instrumentation. 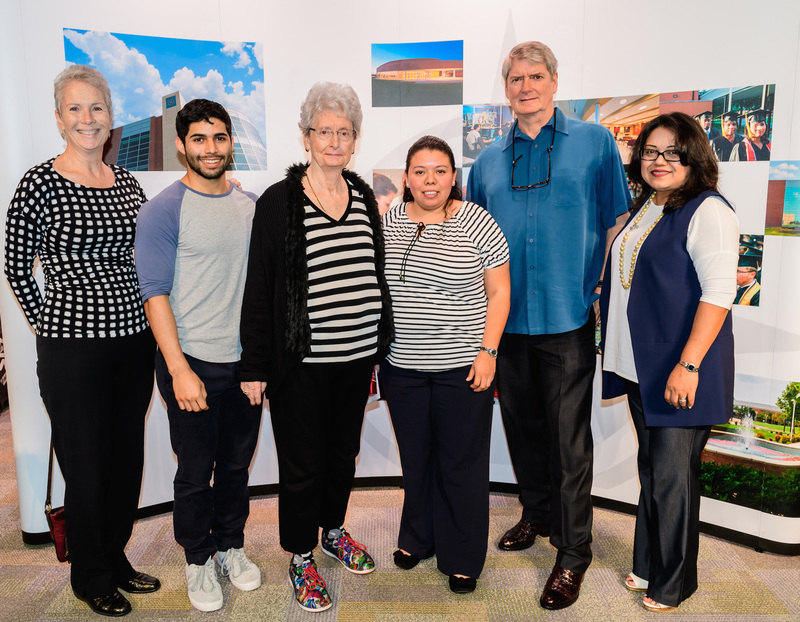 ExxonMobil’s investment in Lee College is vital to students who would otherwise be unable to afford tuition or other expenses without additional resources, said Pres. Dr. Dennis Brown. The difficulty of balancing the rigor of technical programs with work, family and other responsibilities is an obstacle that prevents many from completing their chosen degree or certificate. 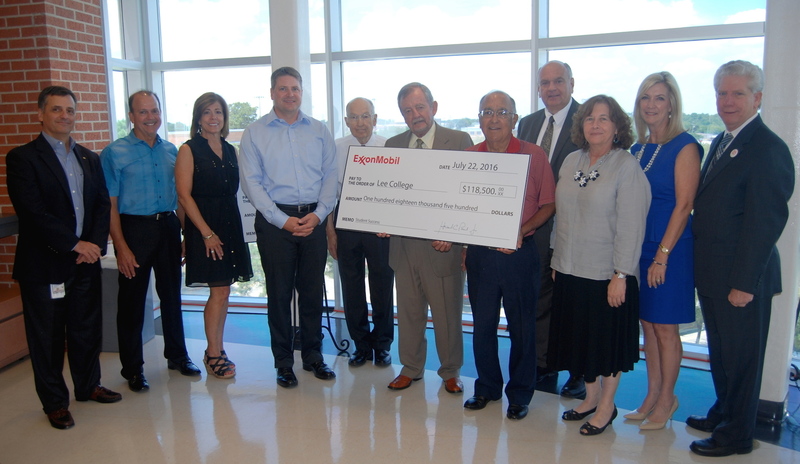 Lee College administrators also noted that ExxonMobil’s support extends beyond the financial. The company offers students internships that give them practical work experience before graduation, and regularly sends its employees to campus to share insights and expertise with both students and faculty. ExxonMobil has also hosted pre-employment testing on campus, and helps the college to build a pipeline of future skilled workers by participating in programs and activities designed to give K-12 students an early introduction to opportunities in science, technology, engineering and mathematics. 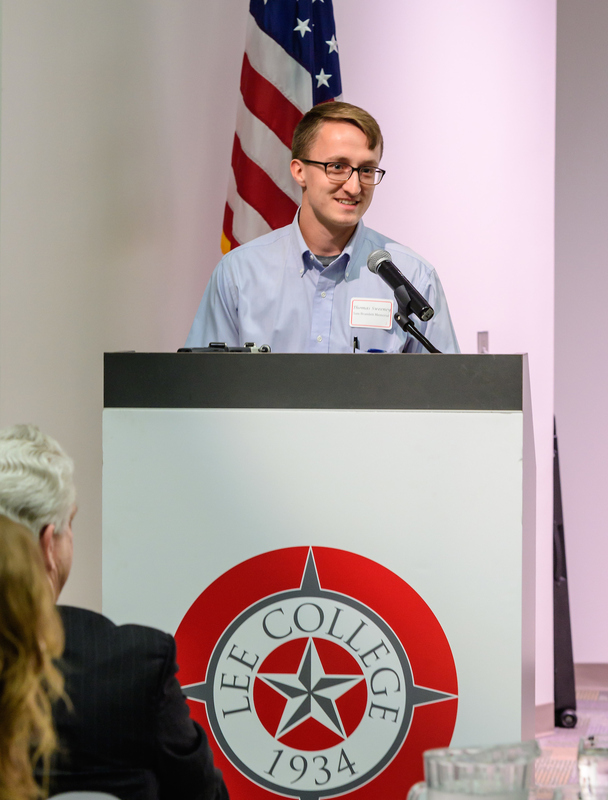 Woody Paul, manager of the ExxonMobil Baytown Olefins Plant, said the company is proud of its longstanding relationship with Lee College and happy to invest in an institution centered on providing the high-quality education that its future employees will need to be successful. 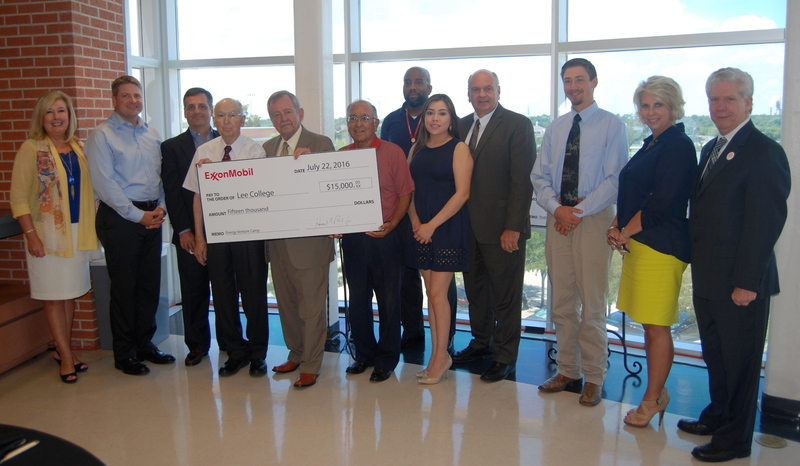 BAYTOWN, TX – Students pursuing technical programs of study at Lee College now have additional money to help fund their education after the East Harris County Manufacturers Association (EHCMA) donated $140,000 for scholarships and other academic support. 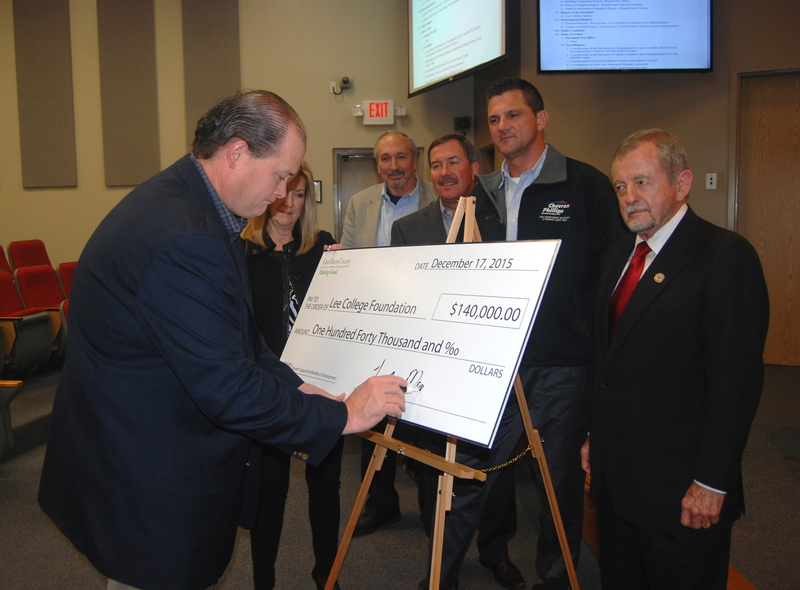 Todd Monette, outgoing Board Chairman for the East Harris County Manufacturers Association (EHCMA), signs a $140,000 donation check Thursday, Dec. 17, 2015, at the regular meeting of the Lee College Board of Regents. The association raised the money at its second annual golf tournament to provide scholarships and support for students in technical programs. Also pictured (l-r) are Pam Warford, Executive Director of the Lee College Foundation; Craig Beskid, EHCMA Executive Director; Monty Heins, incoming EHCMA Board Chairman; Roy Watson, Chairman of the EHCMA Workforce Development Committee; and Ronn Haddox, Chairman of the Lee College Board of Regents. EHCMA Executive Director Craig Beskid, outgoing Board Chairman Todd Monette, incoming Board Chairman Monty Heins and Workforce Development Committee Chairman Roy Watson presented the donation check Thursday, Dec. 17, at the regular meeting of the Lee College Board of Regents. The money was raised at the second annual EHCMA Workforce Development Golf Tournament in November, in which more than 35 teams from more than 70 companies in the manufacturing and construction industries participated this year. Proceeds from the tournament exceed the association’s goals, and were divided between Lee and San Jacinto College. EHCMA focuses heavily on the workforce development issues facing the industry and sponsors numerous initiatives to create opportunities for local students to access skilled education programs, particularly focused on successful petrochemical or manufacturing careers. BAYTOWN, TX – As they wrap up the fall 2015 semester and prepare for winter break, students at Lee College are looking to spread the holiday spirit by collecting donations to help those in need in the local community. 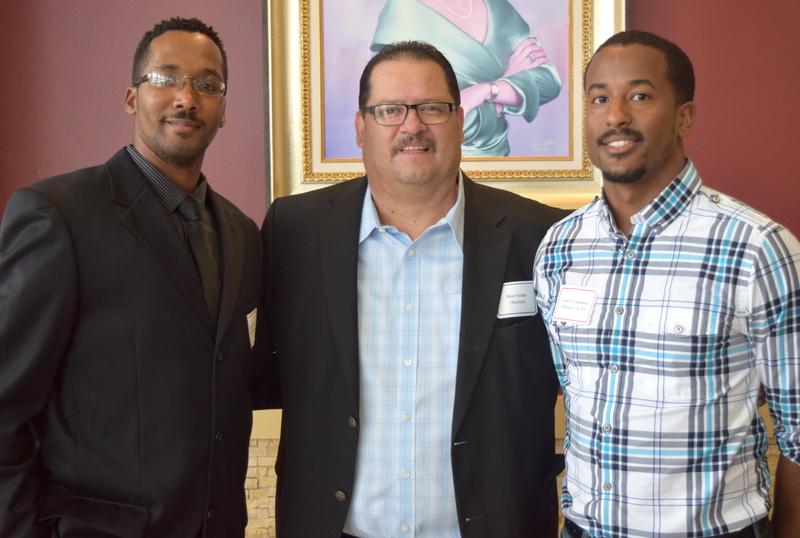 Reaching Excellence Against Limitations (REAL), a new student organization that aims to educate and empower black males by enhancing their skills and creating positive change, has adopted a Baytown family for its inaugural Family First fundraising campaign – launched this year by group president, Runnin’ Rebel Basketball player and Baytown native Javonte Cooper. REAL is soliciting monetary donations that will be placed on a grocery store gift card and given to a single mother and her three children to ensure they can experience the full joy of a holiday meal, from shopping for ingredients to cooking and sharing quality time together. To make a donation on campus in room 233 of the Huddle Building or schedule a pick-up, contact adviser Jessica Falla at 281.425.6421 or jfalla@lee.edu. Keeping in mind their promise as military service members to leave no one behind, the Student-Veterans of Lee College (SVLC) are accepting donations to be given to veterans in hospice care at the Michael E. DeBakey Veterans Affairs Medical Center in Houston. The group has decided to make helping and visiting veterans in hospice – estimated to total more than 1.5 million nationwide – a priority of their community outreach. SVLC is looking for a wide variety of items, including travel-sized toiletries; reading materials and stationary; new and gently used clothing and hats for men and women; undergarments in unopened packages; socks; bedding; phone cards; and entertainment and leisure items like puzzles, board games, video games and DVDs. For more information about the items needed and how to donate, contact the Lee College Veterans Center at 832.556.4300.